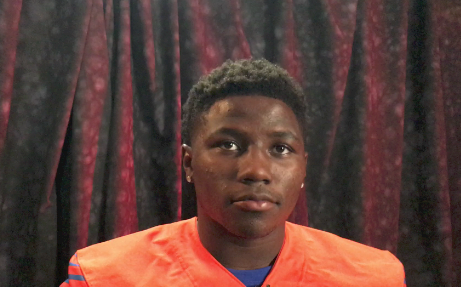 Bishop Gorman wide receiver Tyjon Lindsey said Thursday that he will have to undergo surgery for torn meniscus in high right knee and that his high school football playing days have come to an end. The 5-foot-9, 180-pounder, who has drawn comparisons to current NFL receivers DeSean Jackson (Redskins) and De’Anthony Thomas (Chiefs) for his explosive speed and cut-on-a-dime moves, injured the knee after making a 32-yard catch early in the Gaels’ 69-13 win at Spring Valley on Oct. 7. The Ohio State-bound Lindsey was rated a five-star recruit by national talent scout Tom Lemming and is rated the nation’s No. 77 overall prospect on ESPN.com’s Top 300. He was selected to play in the 2017 U.S. Army All-American Bowl on Jan. 7 in San Antonio but said he doesn’t plan to play now so he can focus on rehabbing the injury. Lindsey had previously missed the first four games of the season with a broken collarbone suffered in a scrimmage against Liberty. He caught five passes for 125 yards and two touchdowns while playing parts of wins over Bonanza and Spring Valley and the entire game in Gorman’s memorable 25-24 triple-overtime win over St. Thomas Aquinas of Fort Lauderdale, Fla.
Lindsey played a key offensive role in back-to-back national championships for the Gaels, catching 34 passes for 884 yards and 15 touchdowns as a sophomore and 45 passes for 1,117 yards and 14 TDs as a junior. He also had two punt returns for touchdowns in each season. Just like that my season is over… It's been a loooooong journey of 4 years playing varsity football, but it has been cut short for me.